Chocolate Strawberry Cookies that are vegan and gluten free. Valentine’s Day is just around the corner and I have one more recipe idea for you. These chocolate strawberry vegan Cookies would be PERFECT! Don’t you think chocolate and strawberries make a fabulous combination? These yummy cookies have twice the amount of chocolate. Not only is there a chocolate drizzle over the top, but there are also chocolate chips packed inside of each cookie. You have got to try these yummy cookies. It took me a few attempts to make these red cookies. I originally tried using beet juice, but after the cookies baked, all the red color disappeared. So I used freeze dried strawberries for this recipe, and they came out great! 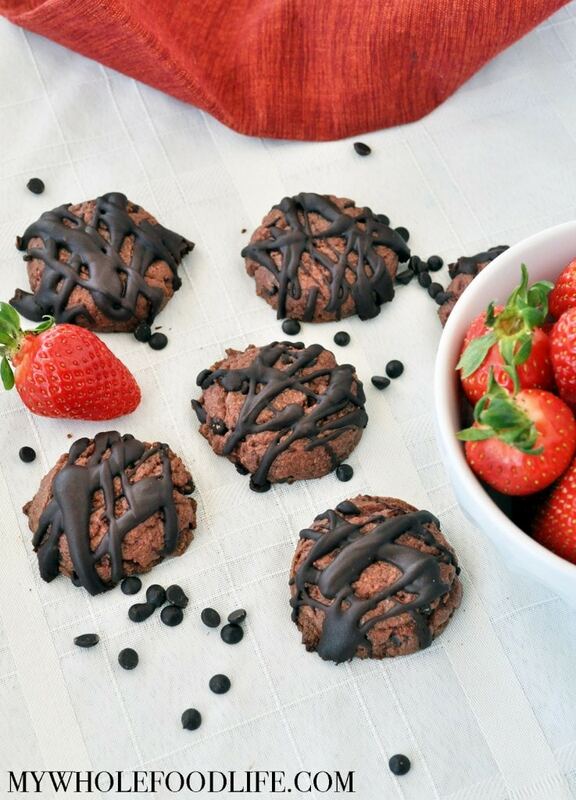 These Chocolate Strawberry Cookies are vegan, gluten free and grain free. I hope you enjoy them. The perfect Valentine's Day cookie! In a food processor , combine the cashew butter and strawberries. Blend until well incorporated. Add in the cacao powder and maple syrup. Blend. Lastly, add the 1/4 cup chocolate chips and pulse just to get them mixed well. Using a cookie scoop , drop the cookies on a lined baking sheet . Use your palm to flatten each cookie. Bake for about 10 minutes. Let cool completely before you make the chocolate drizzle. To make the chocolate drizzle, melt the chocolate chips and almond milk in a double boiler. Once the chocolate is melted, drizzle a little over each cookie. Store in the fridge to set. Keep these cookies stored in the fridge or freezer. They should last about 2 weeks in the fridge and up to 6 months in the freezer. Enjoy! These look delish, yum! I love chocolate and berries together-it's the best! What can I use in place of cashew butter if I cannot find this ? Could we use plain strawberries? Maybe dehydrated in the oven for a little while so they aren't so juicy? You may be able to, but I would use slightly less than 2 cups. You also may need to add a little flour if the batter is too wet. A fabulous combination indeed! I love that you used cashew butter, that's my ultimate favorite baking fat :D so rich, creamy and fairly taste neutral too. Though I bet coconut butter would taste amazing here as well! Thanks Lucie! Yes I think coconut butter would be awesome too! Looks yummy ! Melissa I have to tell you - I bought your "DIY Nut Milks, Nut Butters & More" cookbook and it is a Gem!!! I love so many things about it. I love that it's square in shape; I love the beautiful photographs; I love your interesting comments at the beginning of each recipe; I love everything about the page set-up; I love that there are recipes using the nut pulp from making nut milks; I love that there are so very many recipes! I'm a real arm-chair recipe book reader and guess what - I think your book is actually going to get me into the kitchen "using" the recipes instead of simply enjoying reading them ! Thanks so much! Aw, thank you so much Kathryn! You just made my day. ;) Btw, I have a new book coming out at the beginning of September! Stay tuned for more info in the next few weeks! Mmm, this sounds like an amazing combination! Thanks for posting! I'm sure having to try several batches of these yummy cookies was such a hardship!!! :P I can't wait to try these!! I have just done some research on the cheapest freeze dried strawberry! !